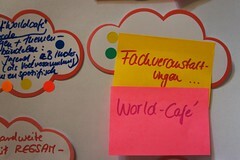 Peter Senge, author of The Fifth Discipline “ has been a fan of the world café from its very beginning over 20 years ago. So it was no surprise when The World Café decided to celebrate its 10th anniversary at a Society for Organizational Learning conference with a celebratory World Café. Juanita Brown and David Isaacs, both founders of the World Café, invited a number of other select world café practitioners and my husband Jeff to co-design this world café with them. 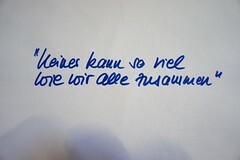 When I heard that he was going to Vienna, I said “You can’t go to Vienna without taking me along!” I had spent a summer in Vienna during my college years and had developed a special affection for the city, its museums, music and architecture. I thought that I would take advantage of his trip and enjoy being in the city. In fact, fate had some else in mind for me. 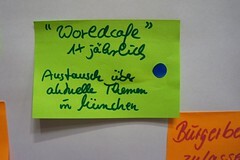 When I arrived in Vienna, I had no knowledge or previous experience with the world café. Jeff, on the other hand, already had started designing and hosting world cafés. I initially did not intend to participate in the SoL conference. However, I did mention to Jeff that I might be able to help to set up the world café tables and serve as an ad hoc translator. I didn’t get to help with the set-up for the world café because I was fortunate to be invited by Juanita Brown and David Isaacs, both founders of the world café, to join the design process. 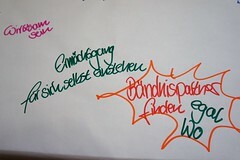 Juanita and David had invited a diverse spectrum of other world café practitioners working throughout Europe to co-create this special world café design: Tatiana Glad, a social entrepreneur from Holland; Ole Qvist-Sørensen a graphic recorder from Denmark and my husband Jeff. A long time friend of the world café and an advocate of organizational learning, David Marsing from Seattle (WA) brought his insight and depth to our considerations. This generous invitation strategy forms the core of Juanita and David’s commitment to sharing their passion for the world café with others. What a wonderful experience! 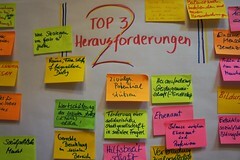 I had facilitated small group discussions like focus groups as part of my work as an evaluator. I was really intrigued by the idea of bringing large groups of people together in conversation with one another. 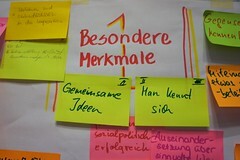 However – like so many people who have not experienced a world café first-hand – I had no idea about the real power and possibilities which emerge from such conversations. I experienced quite a lot of personal “firsts” that day. 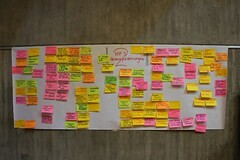 The co-design approach was new to me. Juanita and David made working this way together so natural; it was obvious that they had lots of experience working with diverse groups of people to design world café conversations. 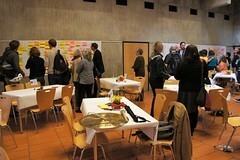 Even though I had just met everyone in the room, a feeling of effortless flow emerged as we began to collectively think about the world café’s design. 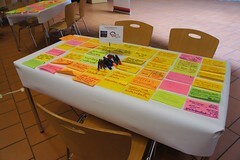 Of course, we spent a long time reflecting about the kind of powerful questions which form the heart of the world café process. 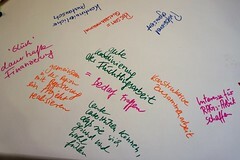 Ole was visualizing our reflections via graphic recording. This was my first experience with capturing a conversation with images, words and color. 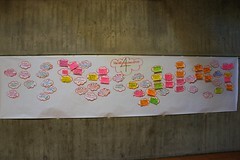 Graphic recording is a process by which ideas emerging from a world café conversation are visually documented in real time. 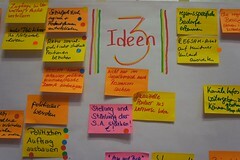 I noted how carefully Juanita took complete (and detailed) notes to document the conversation’s design – something which inspired World Café Europe to create a storyboard documentation process years later. As I entered the room where the world café took place, I was greeted by a sea of round tables each with 4 chairs. I didn’t know it at the time, but this room was filled with world café devotees from all over the world. 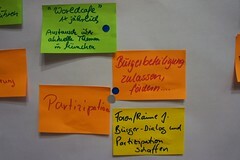 Others, like me, were going to experience a world café for the first time. Even though I had listened in on the design process, I didn’t really know what kind of experience was really awaiting all of us in the room. I took my place at a table with three others. Juanita, David, Tatiana and Jeff started their work as the hosting team for this 10 year anniversary celebratory world café. Then world café magic began. 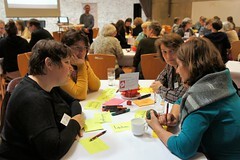 You can try to explain to others what physically happens at a world café – discussing questions, writing on the tablecloths, changing tables etc. – but its ‘magic’ can hardly be satisfactorily described in words. It’s a feeling of closeness with people, whom you have just met; a stimulating milieu in which perspectives are shared and new insights emerge; a space in which new knowledge and understanding is created together; a common sense of flow among many people – all at the same time. In short, it is an amazing – and often a transformative – experience. 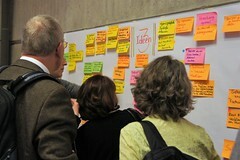 At the end of this first world café, a chap from Belgium stood up and said “This should happen in Europe every year”. Something stirred in me; I felt called to action. It was clear to me that I wanted to continue to be part of this. I attended a breakfast meeting the next day at a typical Viennese café close to the MuseumsQuartier where the SoL conference was being held. Morning meetings – especially those that begin at 7:30 am or so – are not my forte. But this time the call was so strong, that I knew that I had to be present at these initial reflections. Six of us from all over Europe gathered around a table. 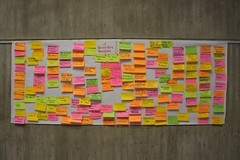 We discussed a lot of ideas and mutually explored possible the next steps. 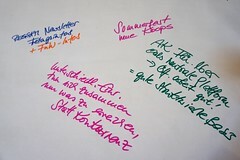 We decided to contact Europe’s other world café practitioners and ask them what they needed to promote the use of the world café in Europe. This, we thought, would inform our on-going efforts. Once again Juanita’s generosity was key to get this process going. Using a list of European contacts which she shared with me, I sent an e-mail to all of them explaining that there was an emerging desire to collaborate across borders in Europe. A flurry of e-mail exchanges ensued. It became clear that we needed face-to-face meetings to explore the possibilities. 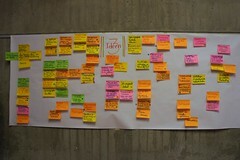 An initial meeting held in Paris began to outline the kind of focus a European world café network could have. These thoughts were solidified in a subsequent meeting in Amsterdam. All of these discussions set the foundation for an emerging pan-European network which sowed the seeds for World Café Europe. I am deeply grateful for the open arms with which Juanita and David greeted me ten years ago. Back then, I was a stranger to the world café. 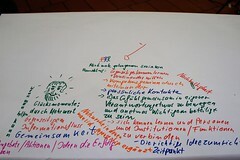 After the flow of my world café conversation in Vienna, my role as an interested stranger evolved into a passionate advocate who was eager to ‘spread’ the magic of the world café to people all over Europe. To this day, I continue this journey with even more passion and sustained dedication. On this 20th anniversary of The World Café, I would like to express my deep gratitude – especially to Juanita and David. I would also like to honor the many inspired people whom I have met along the way and with whom I have had the pleasure to collaborate. This spirit of cooperation which Juanita and David ‚gifted‘ to me ten years ago continues to serve as my personal inspiration to share this ‚magic‘ with others all over Europe.